I thought that the whole wheat would stand out in this recipe, but they honestly taste very close to the buttermilk Aunt Jemima mix. My kids devoured them! I mixed all the dry ingredients the night before and added the wet in the morning. I did not use low-fat buttermilk. I also added blueberries to half the batter. This recipe was taken from Cooking Light magazine March 2010. 1. Weigh or lightly spoon flours into dry measuring cups; level with a knife. Combine flours, sugar, and next 3 ingredients (through salt) in a large bowl, stirring with a whisk. Combine buttermilk, oil, egg, and egg white, stirring with a whisk. Add buttermilk mixture to flour mixture, stirring just until moist. 2. Heat a nonstick griddle or nonstick skillet over medium heat. Coat pan with cooking spray. Spoon about 1/4 cup batter per pancake onto griddle. 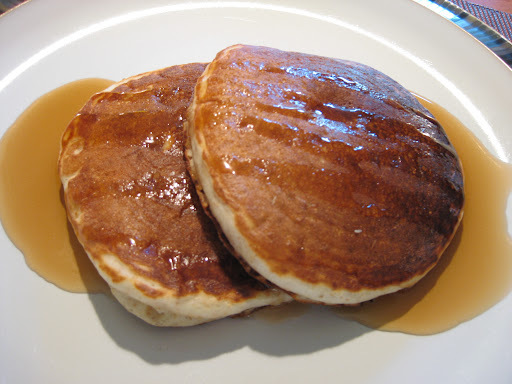 Turn pancakes over when tops are covered with bubbles and edges look cooked. Serve with butter and syrup. Yield: 6 servings. 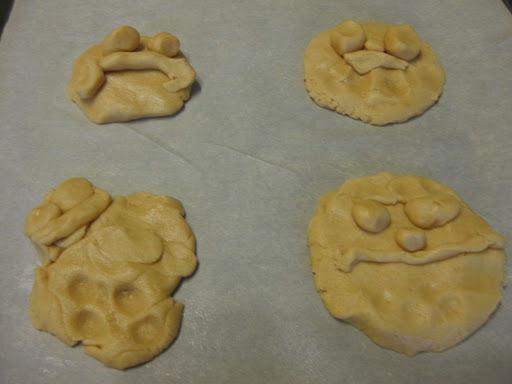 I made the dough this morning and let the kids shape their own cookies. They had lots of fun watching their creations grow in the oven. 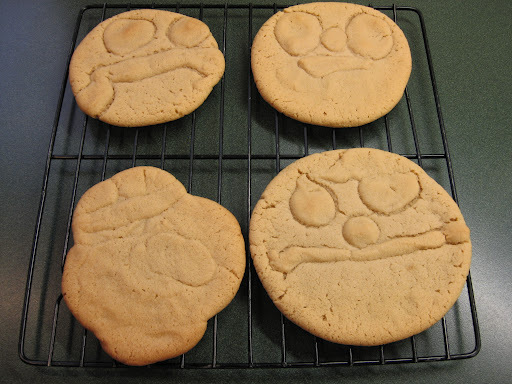 This recipe is taken from Better Homes and Gardens “Cookies For Kids”. I used 1 cup butter instead of the shortening. I also omitted the salt as I used salted butter. Since I made the dough, and not the kids, I just used my electric mixer. 1. Turn oven to 350F. In a large mixing bowl mix shortening and peanut butter with a wooden spoon. Add sugar and brown sugar. Stir till mixed. 2. Add eggs and vanilla. Stir till mixed. 3. In a medium mixing bowl combine flour, baking soda, and salt. Stir into peanut butter mixture till well mixed. Use your hands to mix if you need to. 4. Bake in the 350F oven for 10 to 12 minutes or till light brown on the edges. Let cool on cookie sheets 1 minute. With a pancake turner lift the cookies onto a cooling rack to finish cooling. Makes 36 large cookies. This recipe is taken from “Food” by Guy Fieri. I wish I had some of this left over from making the “Fire-Roasted Shrimp Cocktail” recipe as I would have loved to have made homemade fries to go with it. This recipe makes 1 1/2 cups of ketchup. I used white vinegar instead of the apple cider vinegar, not on purpose though…I just thought I had apple cider vinegar in my pantry which I did not. I bought the agave nectar at VitaHealth (a local health food store) as it is not sold at my local supermarket. 1. Preheat the grill to high. Place the tomatoes skin side up on a baking sheet. Add the red pepper and onion. Brush the vegetables very lightly with the olive oil. Sprinkle with the salt and 1/2 teaspoon of the black pepper. 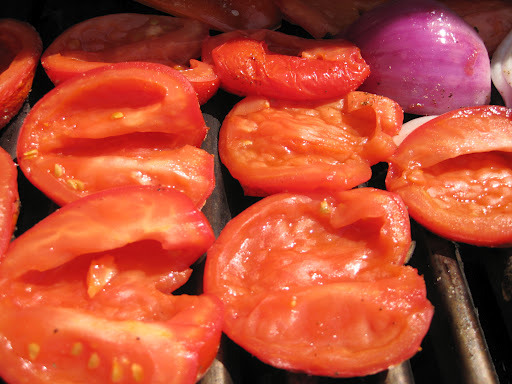 Turn the tomatoes skin side down and grill all the vegetables until lightly browned, 5 to 8 minutes. Set aside to cool slightly. 2. Combine the vegetables, vinegar, agave nectar, mustard, and granulated garlic in a blender or food processor and process until smooth. Taste for seasoning. 3. Let the ketchup sit at room temperature until ready to use. You can make it ahead and refrigerate to for up to 1 week. This recipe took a lot of time, but it was well worth it! I took this recipe from “Food” by Guy Fieri. I highly suggest making the Grilled Ketchup. The recipe is on this blog as well. 1. FOR THE SHRIMP, mix all the ingredients except the shrimp in a resealable 1-gallon plastic bag. 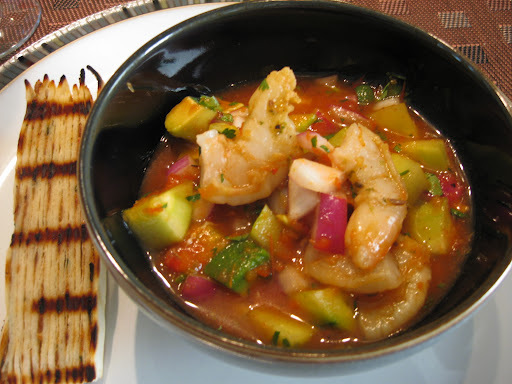 Add the shrimp and marinate in the refrigerator for at least 1 hour or up to 6 hours. 2. Preheat the grill to medium-high. Remove the shrimp from the marinade and drain well. Discard the marinade. Grill the shrimp until opaque, about 3 to 5 minutes. Remove from the heat and refrigerate immediately. 3. FOR THE COCKTAIL MIXTURE, combine the ketchup, soda, lime juice, and hot sauce in a large bowl and mix until blended. Gently mix in the cucumber, avocado, onion, and cilantro. 4. Cut each shrimp into 4 pieces (in half, then each half in half). Stir the shrimp into the cocktail mixture. 5. Serve in martini glasses with slices of lime and saltine crackers. Make this!!! Seriously!! Give yourself enough time to plan for this recipe. This gem was taken from “Food” by Guy Fieri. In his description of this recipe, he says that the onion stack was the number-one-selling appetizer at his restaurant Johnny Garlic’s. I can see why! I could only find 9-inch tortillas and not 8-inch, but it didn’t make a difference, there was enough sauce for layering and dipping. I roasted 3 cloves of garlic and it worked out to a close 3/4 cup. 1. In a large skillet over medium heat, heat the oil. Add the onion and cook for 5 minutes, stirring regularly, until browned but not overly dark. Add the butter and sugar and cook until the onion has thoroughly browned, about 20 to 25 minutes. Remove from the heat, transfer to a medium bowl, and set aside to cool. 2. Add the garlic, Parmesan, mayonnaise, cilantro, and salt and pepper to taste and stir to combine. Cover and refrigerate for at lease 4 hours. 3. Reserve one-third of the mixture in the refrigerator to use to make the dipping sauce. Evenly spread the remaining mixture on the top of 11 of the tortillas. Stack the tortillas on top of one another and top with the remaining tortilla. Wrap the tortilla stack in plastic wrap and refrigerate for 12 to 24 hours to set up. 4. Preheat the grill to medium. Cut the stack into 16 wedges. 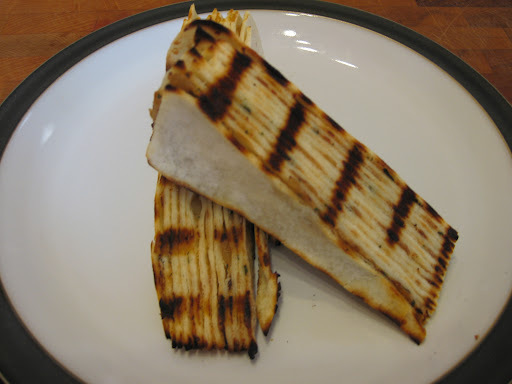 Using tongs, grill each wedge on all sides until it is warmed and grill marks appear. 5. Mix the reserved onion mixture with the balsamic vinegar to make a dipping sauce; season to taste. 6. Serve the wedges with the dipping sauce. I love this dressing on a salad. This recipe is taken from “The Complete Light Kitchen” by Rose Reisman. 1. 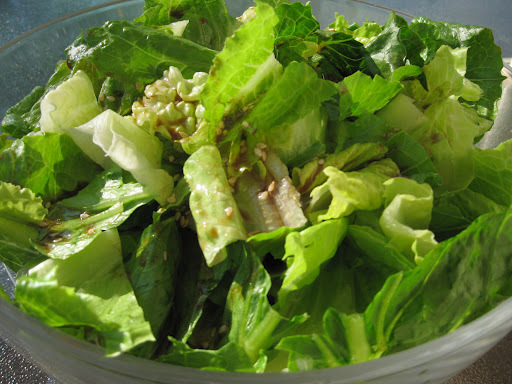 Combine the vinegar, soy sauce, lemon juice, sesame seeds and mustard in a small bowl. Whisk in the vegetable and sesame oils until well combined. 2. Use immediately or refrigerate. Refrigerate for up to 2 weeks.